With smoke still clearing from his first Salute album, Mikael Erlandsson returns with his sophomore release Heart of the Machine. The Last Autumn's Dream vocalist continues the path tread on Toy Soldier. Actually, the music hear could easily have been the second of a two disc set on the former release or simply the songs that didn't make it (simply because he had too many). Nevertheless, this is standard Erlandsson/LAD fare: nearly immaculate, persuasive, and entertaining melodic rock from a true master. So, then, what's new if anything? Nothing really. There's some serious melodic melancholy crooners like I Will Be There and My Part in this Pain, and some nice, simple, straight forward melodic rock like Higher or Feed Your Hunger. Though hardly different, the tastier pieces here may be the lightly 'heavier' The Long Haul, Shadows, or Train of Rock n Roll. But, as I said early, this simply standard, solid, fare from Mr. Erlandsson. So don't let my slightly better than average score fool you or put you off. If you dig Erlandsson, LAD, or masterful melodic, then you will not go wrong with Salute's Heart of the Machine, even in it is a recapitulation of previous material. Recommended. 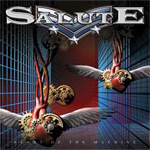 If you dig Erlandsson, LAD, or masterful melodic, then you will not go wrong with Salute's Heart of the Machine, even in it is a recapitulation of previous material.